Trade shows can be beneficial to companies by providing them with new leads, customers, and industry status. However, with these benefits also come resources - especially time and expenses. If you are spending your valuable time and money on a trade show, you want to know that you are getting the most out of your experience. The best way to ensure your company sees a positive ROI on your trade show attendance is by creating smart and actionable goals for each show. Many companies go into trade shows with the expectation of gaining new leads from the trade show. However, a generic goal is much harder to measure than an actionable goal. With the amount of time and expenses you put towards a trade show, you want to be able to see tangible, measured results from your efforts. The best way to achieve this is by developing SMART goals for each trade show you attend. Developing goals with this format allows you to define a goal with numbers to measure and a time frame for completion. It also asks you to think if your goal is one you can reasonably reach in the allotted time frame. As you can see, both statements are trying to achieve a similar goal: new leads. However statement number two gives a realistic number that can be measured to determine if the goal was met. It also gives a time frame for the goal to reach completion. With proper preparation and planning, this goal is realistic and can be attained in the time frame given. Download your free Goal Sheet Template to get started creating actionable goals for your next Trade Show! One of the best ways we’ve found to develop SMART goals and actionable plans for reaching these goals is by using a goal creation worksheet. These templates can be found online or you can download our free template here. Our template specifically relates to trade show goals, but you can tailor it for any goal creation you need for your business. 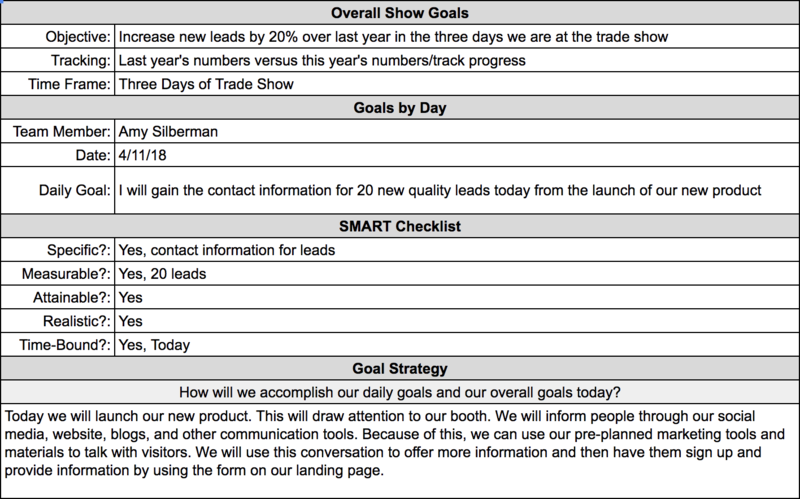 We found the best way to create measurable and actionable goals for a trade show is to not only have an overall goal for your trade show, but also daily goals for each team member attending the show (especially if the show is multiple days). As an example of how using a goal sheet helps to create actionable goals for a trade show, we have created a scenario using an upcoming Securities Trade Show. Each goal sheet will have information about the trade show itself, your product, and your ideal customer for that show. It will also allow you to create both overall goals and daily goals for each show. Since your goals will determine your entire marketing strategy for your upcoming trade show, you first need to clarify who you will be marketing to and what you will be marketing at the show. This will allow you to create goals that match what you need to sell. As you can see in the example below, we like to clarify who our ideal customer at the show is with a buyer persona. This is the person who will be most interested in our featured product or service. We also can determine what our theme will be for the show, which can be based on if we are marketing a specific product or service or just our company as a whole. After we know who our ideal customer is and what we will be focusing on for the show, we can begin to develop our SMART goal(s) for the show. Why are we attending this trade show? What product or service are we marketing? How does this relate to our marketing goals? While the answers to some of these questions may seem obvious, it is good to see them written down. Not only can it help you clarify what you want to get out of the show, but it can also help ensure everyone on your team is on the same page for the end goal of the show. Once these questions have been answered, you can decide what the generic end goal will be for the show (i.e. gain new leads, build our email list, more website traffic). After you have created a generic goal, you can then go through the SMART checklist to further clarify your goal and make it SMART and actionable. A good way to ensure every team member is on the same page and stays on track during the show is to incorporate daily goals for each person. We recommend you have a short team meeting at the beginning and end of each day of the trade show to encourage the setting and meeting of these daily goals. Each daily goal should also meet the criteria of a SMART goal. You should encourage your team to focus especially on the attainable and realistic attributes of this checklist. No one should be discouraged by setting an unreachable daily goal or let others do all the work by setting a goal that is too low. 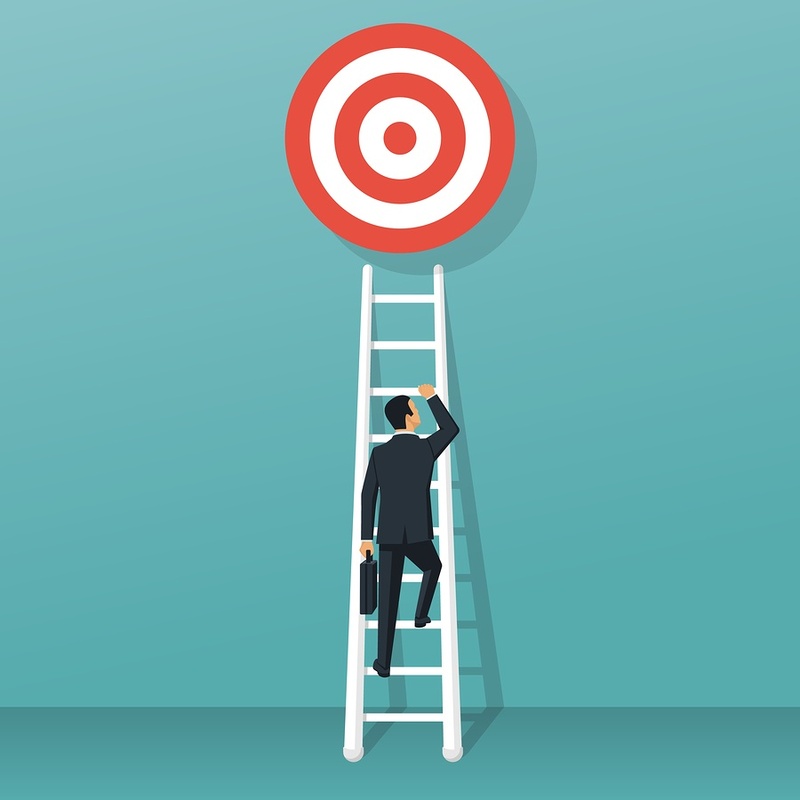 These daily goals will create a sense of accountability for your team members throughout the trade show and also help develop a sense of teamwork as every member is reaching to accomplish the overall show goal. While it may seem like extra work to go through the process of filling out a goal sheet, it can help you and your team clarify your goals for each trade show. You are spending time and company resources on a trade show with the expectation that it will help your company. By taking the time to fully develop a SMART and actionable goal for each show, you can see the exact benefits a trade show provides your company and encourage your team to meet an achievable predetermined number instead of an arbitrary amount of new leads. 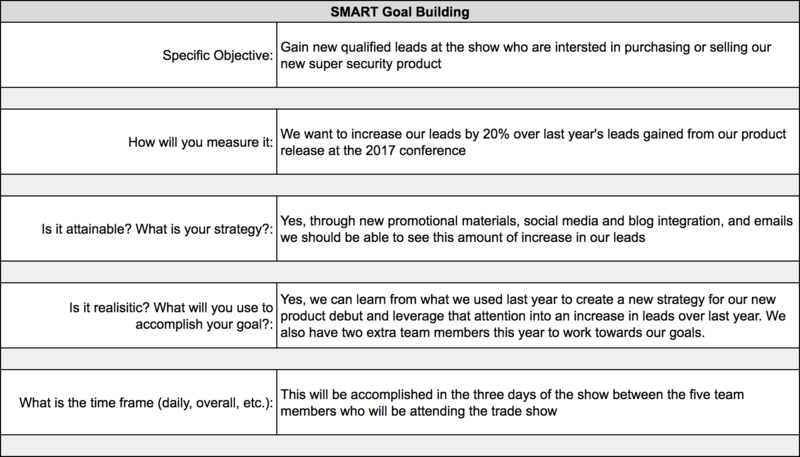 If you are interested in creating your own SMART goals for an upcoming trade show, download our free Goal Sheet template to get started!